You are called CONCENTRIX and I was never told, why your name is Concentrix, how your name was formed. Even I didn't care to search for it. Why would I, at that time. But later, on one evening, in the month of August 2015, I was crossing the Phase 3 metro station while going back to home after completing my shift, when I got the answer by myself. I don't know whether it is right or wrong, I don't care, because at least, I believe it. 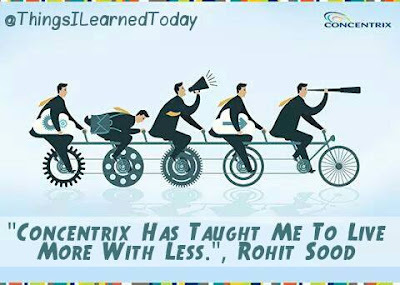 The Answer is as follows: "ConCentrix" can be divided into "Con" and "Centrix" in which "Con" means "Consumer" and "Centrix" stands for "Centric". "This is how, The Consumer Centric Company can be stated as Concentrix. " Hats Off to the founder of that name. I don't know when you were formed or who are your founders but one thing I am definitely certain that you also like to spend time with all of us that you make us sit with you for more than office hours in the form of OT. Seriously??!! You also prefer to pay us to be with you for more time? Dear, Be Confident enough to show your right own us (Lol). We love you. Not sure about others, but I do, and I will definitely miss you as you have given me courage to stand again after falling and dream higher than I could have ever imagined. I will write to you, in future, to thank you for everything, once I achieve those dreams. When I passed out from St. Joseph Convent School, I didn't want to leave it but I had to. When I graduated from Kamla Nehru Public School, I was sad for leaving it behind. 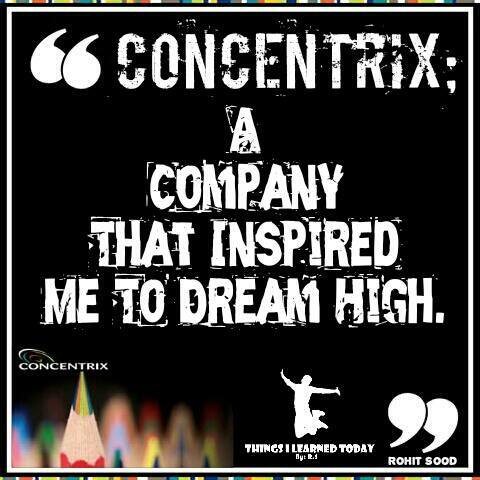 When ultimately, I was told that I had to leave LPU to join Concentrix, I wasn't ready for it but I still had to. After joining Concentrix, I never felt lonely to miss LPU that much, because the love I got from you, was amazingly remarkable which cannot be expressed in words. No matter, how much I resisted to leave School or University, I had to leave them to join a different place for my growth and development. For instance, after this long-term relation, Today, I am not willing to leave you but I have to leave you today, for my own betterment. I am proud to say that I was part of this company for you have given me the courage to dream high, taught me to live more with less, brought me in contact with number of people who are not only amazing but have forward looking approach in their life, which really motivate me. One day, I will also make you proud of me. You seem like a Big Boss now because I have never seen you but still I obeyed you and Love You. May be that is why, Love is called An Intangible Feeling. I hereby thank you for everything which you gave me in this relationship. May this bond lasts forever in our minds as a wonderful memory. May God Bless You With Prosperity And Success Which You Can Share With Your Employees That Manage You Perfectly. I Wish You All The Best. Its hard to say, but for today, I have To Say It; A Word Which Is Pronounced As "GoodBye".